I love koi.. I used to have a whole tank full of them. They're so beautiful. 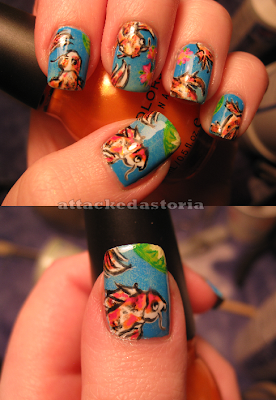 I've been wanting to try koi nails, but as you can see, they turned out pretty bad. Ugh. I'll definitely have to try again. I was going to take them off, but I have to run errands tomorrow, and I'm too lazy to redo them. I've been feeling pretty crappy, which I should've taken as a sign.. oh well. You win some, you lose some, right? 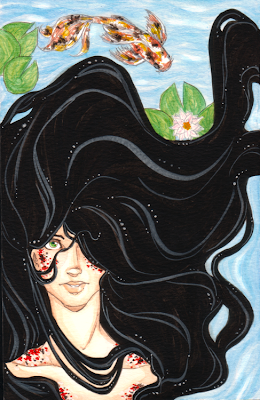 I will now leave you with this painting I did, that looks far better than my icky nails. I think these look really awesome! Haha, I love both the painting and your nails! &I really like your painting too. You're very talented. Are you kidding...!? These are awesome! You're too hard on yourself. All of your nails are great and your painting is really beautiful. Please don't be so hard on yourself. They are lovely. I am very picky and have learned that most people don't notice nail flaws like i do on myself. Let the comments speak for themselves.